The Classic Tetris World Championship has come to a close in Portland, Oregon and the results are eye-opening for anyone who has followed this competition over the years. Seven-time world champion Jonas Neubauer climbed to the Grand Finals again, but he was stunned by a young 16-year-old kid who came out of nowhere to become the new King of NES Tetris. 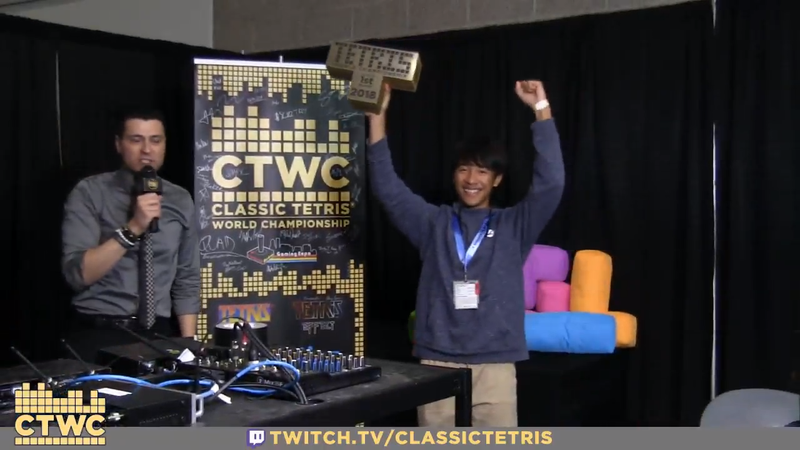 Joseph Saelee took the Grand Finals in three games to become the new Classic Tetris World Champion. Neubauer found himself falling behind early, going down 0-2 in the series. He hit another wall in the final game, but thought he had built up a safe enough lead to clinch Game 3. However, Saelee was able to climb back from behind and overcome Jonas' score just before reaching the killer Level 29, allowing him to clinch the tournament. Neubauer had previously won seven of the past eight CTWC tournaments, losing only in 2014 to Harry Hong, who was the first player ever to reach the max score of 999,999 in NES Tetris. Saelee is relatively new to the Tetris scene, but he's been getting more and more into the competitive field over the past year. Just weeks prior to this year's CTWC competition, Saelee managed to reach the elusive Level 31, hitting 311 lines. It was a hotly-contested top eight, with Saelee knocking off some top level talent en route to the finals. In the semifinals, Saelee managed to defeat Koryan, a legendary Tetris Grand Master out of Japan. For his victory, Saelee takes home a $1,000 grand prize. Cool article! Thanks for highlighting the scene. It was truly an impressive win.